Mutt scrolls the index of email folders up or down, one line at a time, with the press of a single key: ‘<‘ or ‘>’. This is a very convenient way to skim through email folder listings, so I wrote a small bit of Emacs Lisp to do the same in Gnus tonight. ;; Scrolling like mutt for group, summary, and article buffers. ;; of Gnus, this doesn't have to be an annoyance anymore. "Set up '<' and '>' keys to scroll down/up one line, like mutt." ;; mutt-like scrolling of summary buffers with '<' and '>' keys. This is now the latest addition to my ~/.gnus startup code, and we’re one step closer to making Gnus behave like my favorite old-time mailer. This entry was posted in Computers, Emacs, Email, Free software, FreeBSD, GNU/Linux, Gnus, Linux, Open source, Programming, Software and tagged Computers, Emacs, Email, Free software, FreeBSD, GNU/Linux, Gnus, Linux, Open source, Programming, Software on 2013-03-11 by keramida. This entry was posted in Computers, Emacs, Free software, Fun, Gnus, Mercurial, Open source, Software and tagged Computers, Emacs, Free software, Fun, Gnus, hellug, Mercurial, Open source, Software on 2008-11-15 by keramida. This entry was posted in Computers, Emacs, Free software, Gnus, Lisp, Open source, Software and tagged Computers, Emacs, Free software, Gnus, hellug, Lisp, Open source, Software on 2008-04-17 by keramida. 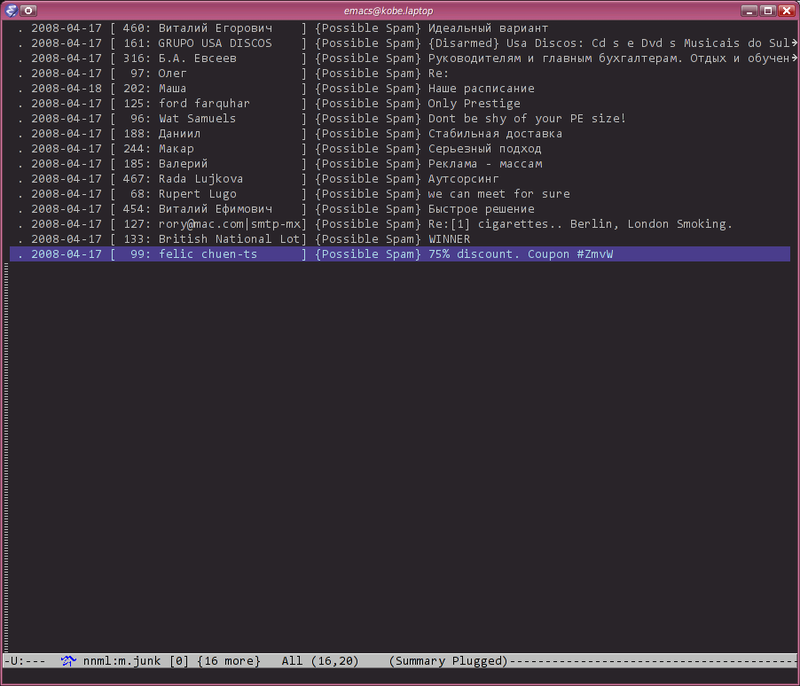 I’ve been using Gnus running inside GNU Emacs for my main email and news reader for a few weeks now. It has been a rather pleasing ride so far, and I am only now beginning to appreciate the infinite configurability and customizability that a Lisp based mailer offers. This entry was posted in Computers, Free software, Open source, Programming, Software and tagged Computers, Emacs, Free software, Gnus, hellug, Open source, Programming, Software on 2008-04-13 by keramida. This entry was posted in Computers, Emacs, Free software, FreeBSD, Gnus, Open source, Software and tagged Computers, Emacs, Free software, FreeBSD, Gnus, hellug, Open source, Software on 2007-01-12 by keramida.